As you may or may not know, I go to school at Western Washington University. Last year, my freshman year, I lived on campus in a dorm, I am living at home with my parents for the summer so I can work an save money. Come September I will be moving into an apartment with 3 other girls! So naturally I have spent the summer collecting furniture for my apartment. This new series called Apartment Decor DIY is going to show what I am making and or renovating for my apartment! 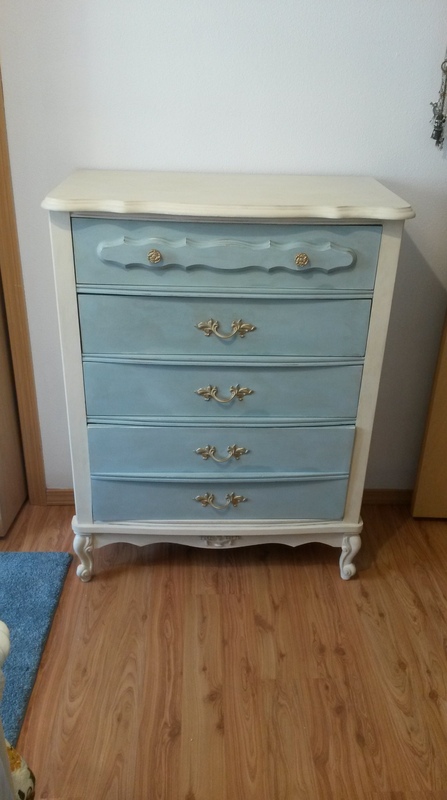 I am obsessed with finding old pieces of furniture and fixing them so they look shiny and new! 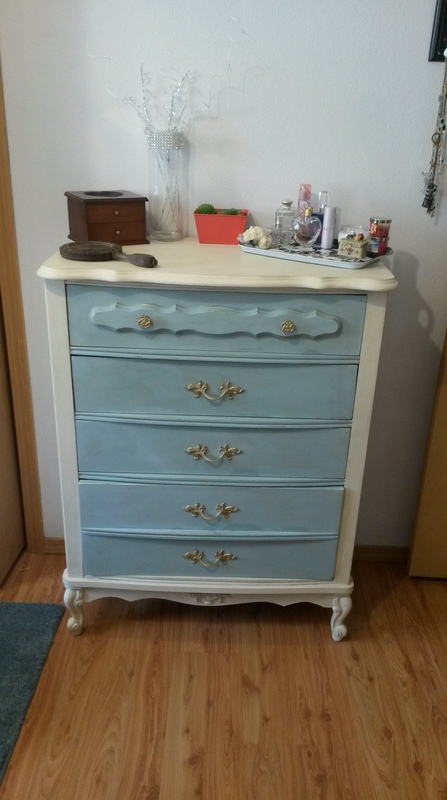 My first DIY post is showing step by step how I renovated my new dresser! Granted I didn’t do very much, the small details I did fix however made all of the difference in this piece. This is the dresser in the antique shop right after we purchased it. I found the dresser at an antique shop on Camano Island that I love called The Spare Room, this shop is always my go to when I am looking for something old and vintage that is still in good condition. Right when I saw this dresser I knew exactly what I wanted to do to it. 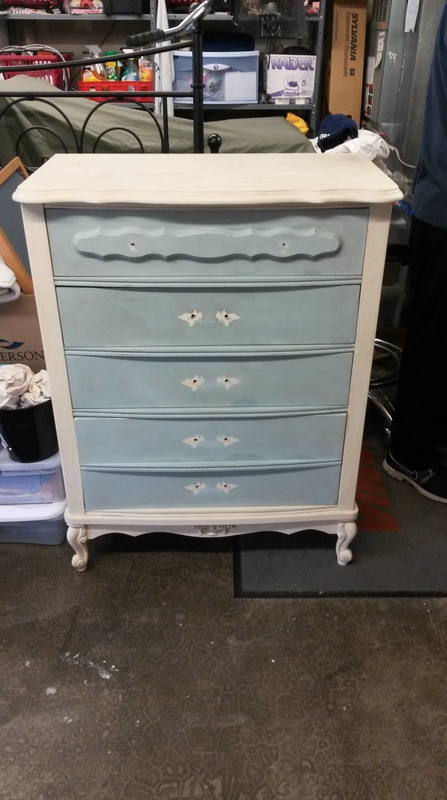 The owner of the shop had already repainted it and did a wonderful job aging the paint and the colors are perfect, however, she painted blue right over the beautiful knobs and handles. I could see through the paint that the hardware was originally gold or bronze and I was disappointed it was painted over. So I fixed the problem. Spray paint in the color of your choice to use on the hardware and paint in your color of choice if you plan on painting more than just the hardware. I used Krylon spray paint in gold, I bought this from Walmart. Next thing you need is an empty box to paint in, a shallow box is best for better ventilation of the paint fumes but unfortunately all I had was a deep box so I had to take frequent breaks so I didn’t get a head ache. And an important step to remember is to put on a shirt and pants that you can get paint on, and make sure your hair is up so you don’t get paint in it. All there is left to do is to take the handles off the dresser! Once the handles are off, wash and dry them to make sure they don’t have dust on them that will show through the paint, put the handles in the box and spray until they look the way you want! 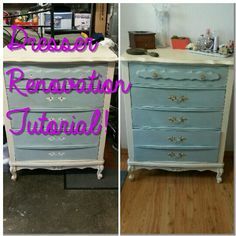 Like this post if this gave you some inspiration to renovate an old piece of furniture! And comment to let me know what you have renovated or would like to renovate! 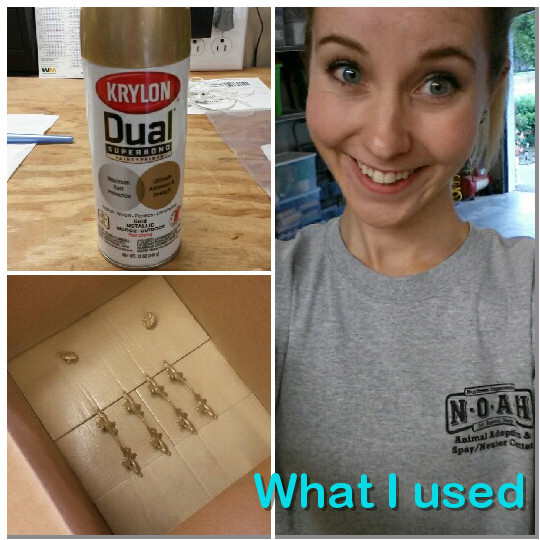 Stay tuned for more DIY posts as I get ready for the big move in September! Dresser after I removed the handles. Dresser with the painted handles back on and in my bedroom! Dresser all settled into my room and looking beautiful!